or call IPG at (800) 888-4741 or email orders@ipgbook.com. ISBN: 978-0-9899087-2-6. Paperback. 416 pages. $18.99. Twenty years later, Gary relocates to the United States—destination Detroit. Blue collar. Motor City. Hockeytown. Where football means Detroit Lions—and soccer is virtually nonexistent. Embarking on a journey thousands of miles from home, Gary is determined to reconnect with the team and the game he left behind. Before long, he is thrust into an early morning underground subculture of soccer fanatics. Could America be waking up to soccer? 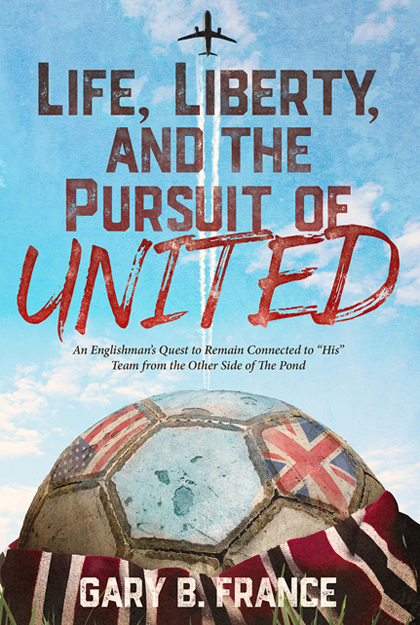 Full of warmth, and self-deprecating northern English humor, “Life, Liberty, and the Pursuit of United” could very well be a long-lost relative to “Fever Pitch” — if Nick Hornby was from the North West of England, supported Manchester United, and had moved to the United States in the mid-1990s! GARY B. FRANCE has been a Manchester United fanatic for over forty years. An avid writer, Gary has always maintained a diary to reflect on his journey. He has turned many of these recollections into his first book “Life, Liberty, and the Pursuit of United,” a twenty-year labor of love. Every journey has its own story . . .